Home » General » Information about Granite Countertops: 6 Hot Tips! Information about Granite Countertops: 6 Hot Tips! In an earlier post we considered the options available in choosing different types of kitchen countertop. The most popular preference for countertops though certainly seems to be the granite counter, so we dedicate this post to providing information about granite countertops and particularly the most popular granite countertops to help you choose the right one for you. Granite is a great choice that will make your kitchen beautiful while actually increasing its functionality, since it provides an excellent work environment for the cook of the home. It is thus both a great investment and improvement for the home. This comes at a price, however: granite is very expensive and often non-returnable. So you want to get it right from the start. To help here are 6 hot tips to give you the information about granite that you’ll need. Take account of these considerations. 1. Hue: Granite comes in such a rainbow of colors the choice can be overwhelming. Here’s a thought, though, while most people look to match their granite choice with the existing wall and floor colors, make the granite, the big ticket investment, the focus of your ideal kitchen. It’s easier to repaint walls and floor and better to spend the big bucks on the hue that really works for you. 2. Color: Consider as well kitchen size and the overall scheme of the room. Perhaps what the room needs is not something in keeping with what’s there but a splash of surprising color? Then choose granite that jumps out in a neutral kitchen. When choosing for smaller rooms, consider green and blue hues that will open up the space. For a homier look, especially if size is not an issue, yellows, tans and browns do the trick. 3. Pattern: The pattern of the granite is important, too. A large pattern in small kitchens will make the room feel cramped as the countertop could overwhelm the space. 4. 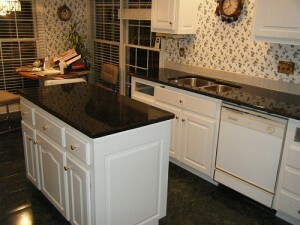 Finish: You have two major choices in finishes for the granite countertop. A flat finish comes with a smooth appearance that might be nice on the eye, be aware though it is more prone to staining. The polished finish provides the granite countertop a glossy look and more durable structure. 5. Light: Remember, just because it looks great on the showroom floor doesn’t mean it will in your kitchen. It’s true, if you’re making the granite the center piece of the kitchen, you might be willing to also redo the lighting to suit the countertops. This is a bigger and more expensive commitment, but, even then, the play of natural light coming through the windows can make a big difference. Take a larger sized sample home with you and do some experiments. 6. Consistency and Variation: And yet two more options you’ll need to consider and choose between. Consistent granite has a solid pattern, repeated throughout the stone slab. Variegated granite has unique customization due to sporadic design; consequently, it will not be consistent throughout the whole stone surface. Some very interesting color and tone patterns can be had with variegated granite. At the end of the day, this is always a very personal decision, but, again, one you have to get right the first time. Hopefully these hot tips have provided you some important information about granite countertops and how to choose the right one for you.